Chinese phone maker Meizu has come up with a new smartphone called the M3s. This is a small-screen variant of the M3 Note, a 5.5-inch smartphone which was launched in May 2016. Available in two variants (2GB RAM+16GB) priced at ₹ 7,999 and (3GB RAM+32GB) ₹ 9,299, the M3s is likely to be compared to Xiaomi’s Redmi 3s Prime which at ₹ 8,999 is one of the finest small-screen budget smartphones you can buy right now. We reviewed the 2GB+16GB variant and were impressed with many of its elements. The M3s shares the same design language as its bigger sibling, the M3 Note. This is one of the few sub-Rs10,000 smartphones that come with a full metal exterior. The matte finish, the rounded edges and light form-factor (138g) makes it quite handy. The two speakers are placed on the lower side panel on either sides of the microUSB slot. The Redmi 3s Prime also weighs 138g and has a similar metal clad exterior, but with a back-facing fingerprint sensor, while in the M3s, the fingerprint sensor is integrated with the home button on the front panel. This makes it always accessible and provides a layer of extra security to the phone. The sensor is easy to set up and quite accurate on most occasions. The other cool feature of the home button is that it is the only navigation button on the phone. Tapping it once will take you on the back page and a long press will land you on the home page. The 5-inch display has a screen resolution of 1,280x720p, which puts it at par with the Redmi 3s Prime, on paper. However, we didn’t notice any major difference between the two in terms of colour reproduction. Games don’t look very sharp, but colours look good most of the times. Legibility under bright light is good and so is visibility from odd angles. Like most modern day smartphones, it allows users to modify the colour temperature of the screen, which means you can switch to a warmer tone when you reading under low light (to reduce stress on eyes) and move back to more realistic colours while watching a video or during daytime use. The Meizu smartphone runs a very old Lollipop (5.1) version of Android OS with a layer of their custom UI called FlymeOS on top. This is a very unique interface with very few pre-loaded apps. There are hardly any Google apps except the Play Store and the Google app. There is no app drawer, so all the apps show on the home page itself. Unlike other Chinese phone makers, it doesn’t try to super-impose a new shape on the app icons but allows them to stay as they are. Swiping upwards on the home screen opens the universal search tab, similar to the phone on Huawei ‘s Honour phones. You can search your apps, contacts on the phone or anything on the web by typing in it. The Redmi 3s Prime runs Android 6.0 with a cluttered but more feature rich MIUI interface. The phone runs on MediaTek’s MT6750 octa-core processor with 2GB RAM. While it can handle most tasks and some heavy games such as Need For Speed No Limits comfortably and without heating issues, it doesn’t feel nippy. We noticed a slight lag while switching between apps. It is a dual SIM phone with hybrid SIM slot (you can use two SIM slots or one SIM slot and microSD card at a time) and supports all 4G networks. The phone offers 16GB storage and can take in 256GB microSD cards. The phone’s 3,020mAh battery lasted a whole day when used as a primary phone. The Redmi’s Prime has a slight edge as it runs on a more powerful processor with 3GB RAM and has a bigger 4,100mAh battery too. The 13-megapixel rear camera on the M3s works best in outdoor sunny conditions. It doesn’t try to oversaturate colours as some cameras tend to do, but it fails to light up darker objects in the background very well. Colours in close-up shots look good and sharp. The low-light shots or indoor shots look noisy and washed out. The camera offers a few live filters but no additional modes, unlike the Redmi 3s Prime which offers plenty of cool camera modes. 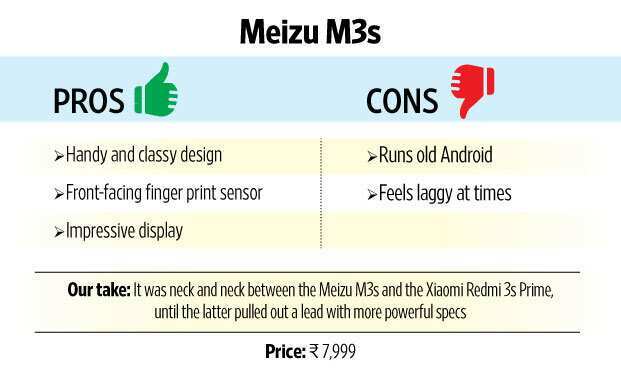 The Meizu M3s is a notable addition to the budget segment and has a lot in common with the Redmi3s Prime as well. Of the two phones, the Redmi 3s Prime is clearly a better device on account of its superior hardware, better battery backup, more internal storage (32GB) and new Android (Marshmallow).